Kim Allsup has been teaching gardening at the Waldorf School of Cape Cod for ten years. 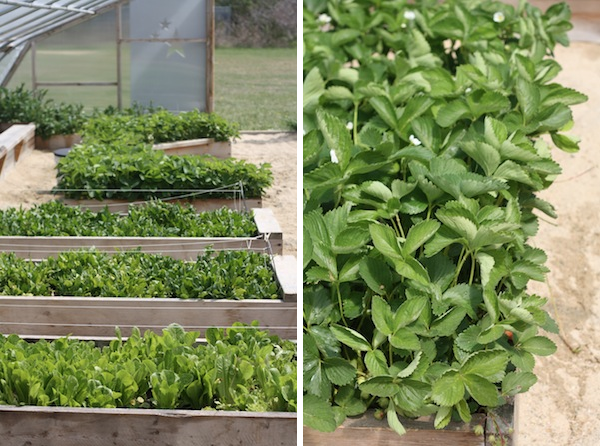 Last spring parents helped put up an unheated hoop house, and this year for the first time, the kids were able to grow food for the cafeteria year round. Several other schools in our area have had the same idea—to get kids' hands in the dirt all winter with an enclosed growing space. You can listen to this week's Local Food Report to hear more. Over here, though, I wanted to share an essay from Kim on a special variety of kale the Waldorf students are growing. It was late-September when Maxwell, a dark haired third grader with a thoughtful demeanor, handed me a tray of three-inch tall kale seedlings. "My neighbor gave these to us for our school garden," he said eagerly. I looked at the tender plants that I would have loved to transplant in May and was incredulous as I heard my own voice say, "Thank you Maxwell, these look great, we can plant them later today," all the while imagining the plants frozen and wilted by mid-November. But Thanksgiving came and went and the kale braved frosts and asked for more. The bed of plants still looked cheerfully green in December, but then, in January, most of the kale succumbed to the freezing temperatures. Still, a few plants at the southern end of the bed were clearly alive. Winter gardening classes were held indoors where we folded origami boxes and then planted tomato seeds in them. But the garden was not out of sight. Each day we walked by the garden on the way to recess, and sometimes I would lead the line of well bundled children through the paths between the 12 foot long wooden beds just so we could check the kale poking green leaves through the snow. "Look, it's still alive," the children proclaimed, taking a few moments for amazement on their way to playtime. By early March the surviving plants looked small, limp and barely alive. Then, as March drew to a close, and the rains of April soaked the garden, the blue-green leaves with ruffled edges and a reddish center stem began to grow again. While we planted and tended our spring crops we witnessed the kale putting out new leaves and then little yellow flowers. The children who worked with me in the summer gardening sessions saw the development of three-inch long green seed pods. By late summer some of the now-brittle silver pods burst open, raining tiny black balls across the garden bed. Soon, little kale seedlings sprouted around the parent plants. We thinned these plant and continued into a second year of kale production from the same parent plants. But the next winter was colder, and, when the blanket of snow disappeared, the bed was empty. However, some of the seeds that had fallen on the bed had waited to germinate with the spring rains, and, again, Maxwell's kale came back. I often thought about the moment when Maxwell handed me that flat of seedlings, of accepting the gift, knowing not that they would begin the permanent kale bed. Life is sometimes defined by such moments, when instinct wins the battle against logic and we find ourselves traveling a wonderful path we had never anticipated. I also thought about Maxwell, who had left the school when his family moved at the end of his fourth grade year. When Maxwell's class was in fifth grade, our school moved to a new campus fifteen miles away. We moved the entire garden in the fall—beds, soil and kale. Again, the kale lived through the winter and this time, in a sunnier location, it grew into a few three-foot tall bushy plants that appeared to hold court in the new garden, older and wiser than the baby corn, pea and lettuce seedlings that poked their noses out of the damp earth. Maxwell's classmates, like all the students in our school, kept the same teacher for up to eight years. Just before their sixth grade year, this teacher stopped me in the hall and said, "You will never guess who will be returning to our class. Remember Maxwell?" I smiled. Just like his kale, Maxwell would be coming back. Kim Allsup teaches gardening at the Waldorf School of Cape Cod. She says to this day, all of her kale seeds come from these seedlings. The students call it "Maxwell's Kale" and often they walk into the building after playtime munching on kale.